William Duvol: Chicago’s Only Revolutionary Soldier? Updated! new info at bottom. There are a couple of Revolutionary vets buried out in Elk Grove, but only one revolutionary soldier is known to be buried in Chicago proper: William Duvol, who died around the 1830s and whose headstone is at Rosehill Cemetery. (note: David Kennison, who is buried in Lincoln Park, claimed to be a vet, but was almost certainly lying). Duvol was probably originally buried in one of the city’s first two official cemeteries, one of which stood near the water tower site (Chicago and Michigan), and one of which was down around 23rd Street on the lake shore. Neither were in use for long, and he was likely moved to City Cemetery in the 1840s, which stood on the site where Lincoln Park is now, before being moved to Rosehill in the 1860s, when City Cemetery closed. His 1830s-era gravestone remained at Rosehill from the 1860s until 2004, when it was replaced after becoming nearly illegible. The original stone at Rosehill said “William Duvol: Soldier of the Revolution” and stated that he had died at the age of 75. The new stone identifies him as a Continental Line soldier; I’m not sure what was done with the old stone, or how they determined even that much about his service. So, who was this guy? Early Chicago history books (which tend to be somewhat exhaustive in giving data about everyone of note who lived in the area) don’t mention Duvol at all, and the main William Duvol who comes up in searches of genealogy sites is an Englishman who was still an Englishman decades after the war. 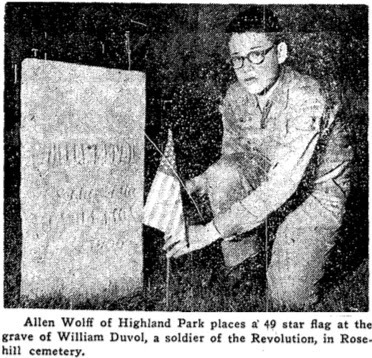 A 1959 article on the gravestone stated that nothing historical could be found on Duvol at all. When the new gravestone was dedicated in 2005, it was said in an article or two that he came from Henrico, Virginia, which sent me down a bit of a rabbit hole. The Virginia “William Duval” (or Du Val) was certainly a revolutionary soldier; in fact, he was quite a prominent citizen around Richmond in the early 19th century; his son went on to serve in congress in the 1830s, as well as serve as the first civilian governor of Florida. The Daughters of the American Revolution has a bit on him, as well, and various sources specifically state that he was from Henrico. 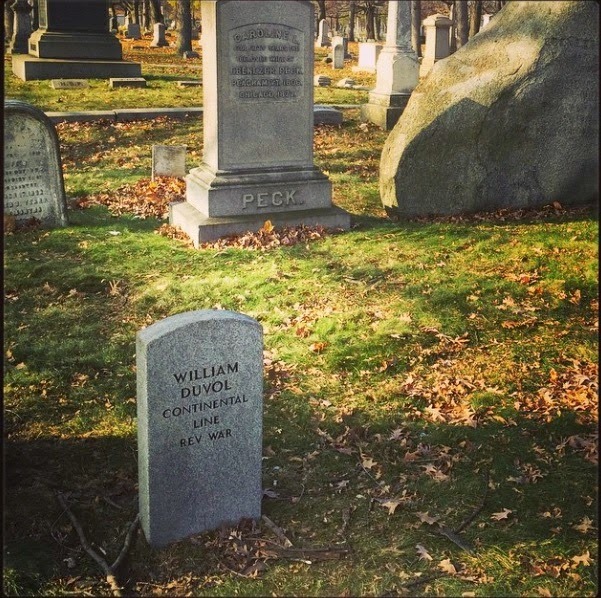 I can assume that the articles stating that the William Duvol at Rosehill was a Henrico man were assuming that the man beneath the stone was Major William Duval. But I’m not sure how they determined that, and, if so, they were wrong; Major Duval died at his plantation in Virginia in 1842. So that takes us back to the drawing board, and the identity and story of William Duvol remains a mystery. Some of the records may have been lost in the Great Chicago Fire, but some may still be out there, waiting to be discovered. It may be that he, like Kennison, was simply telling his neighbors that he was a soldier. It may be that when he died, some neighbor who paid for the stone simply had the impression that he’d been a soldier. It may be that he changed his name somewhere along the line. It may be that he was a soldier who didn’t make it into any early records. One other thing: it’s entirely possible that Duvol isn’t in Rosehill at all. In many cases, when gravestones were moved from City Cemetery to Rosehill or Graceland, the stones were all that were moved, and bodies were left behind. Other bodies couldn’t be moved, because they’d already been stolen by grave robbers working for medical schools (it’s known that this was a problem in the early cemeteries). 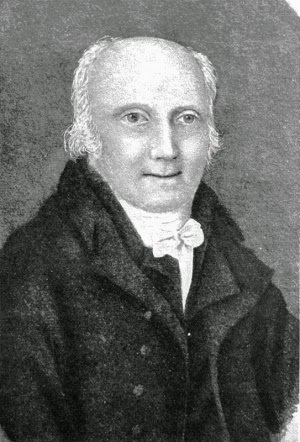 David Kennison was far more prominent and better known that Duvol seems to have been, and had died more recently when City Cemetery was closed, but his remains were certainly never moved. It’s quite conceivable that Duvol remains at rest in Lincoln Park as well, or even near the Magnificent Mile or the South Loop. It turned out Ray Johnson was working on this same case! He found a 1929 register of veterans that actually listed Duvol as a Civil War vet, though with no further information to show how they came to think that. He also found some mention of a William Duval in Illinois Civil War muster rolls (who disappears from the record right after the muster), so there’s a chance that this is actually a Civil War vet. This, though, doesn’t explain the “soldier of the revolution” mark on his original tomb. Ray and I met up at the cemetery today to look things over and compare notes. Right behind his grave is the boulder marking the burial site of Ebenezer Peck, at whose mansion Lincoln decided who would be in his cabinet. We recorded a short podcast that I hope will tide you over until we can get the Johann Hoch one done!